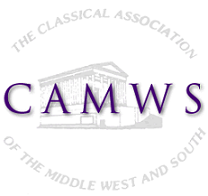 Recipients of this award are nominated by their school, college or university and receive a complimentary one-year membership in CAMWS for the following academic year, including an electronic subscription to The Classical Journal and access to the Loeb Classical Library On-Line and a subscription to Greek Keys. To nominate students for this award, please use this Award Designation Form. Nominators must be current institutional members of CAMWS. CAMWS congratulates all these fine scholars. For a list of previous recipients of this award, see Institutional Members Of CAMWS 2000-Present.